Crate Training a Puppy - A Complete Guide for Dog Owners! Crate Training a Puppy – Complete Guide for Dog Owners! Crate training a puppy in few simple steps is possible. That’s right, even when it seems to be an uphill task for most pet owners. Dog crate training is one of the most researched as well as searched topics on dog training. 1) What is Crate Training? 4) What are the benefits of crate training a puppy? Did you know this? In America, we are fine putting our dogs in crates, But in Australia and Europe it is a big no-no. Wow, in Finland it is illegal! You must be saying: hey it is just a dog crate what so big deal about it. That’s right, it is also one of the most controversial topics when it comes to discussing dog safety. A “dog crate” search on Google will give you more than half a million results which is more than what a search on “Isaac Newton” will give you! Hence, you can easily guess its popularity. Since a dog crate is an enclosed place for a dog, it is sometimes incorrectly understood to be a dog punishment area. And as with any debatable topic, dog crate training is also surrounded by lots of misinformation and rumors. And this is the purpose of this guide. To dispel rumors. And to present you with the right way to crate train a dog successfully. Before we go further, a few words on the importance of a dog crate. Have we ever questioned the necessity of a passenger seat belt in a car? Or the need of a crib at home? Or a child car seat in a vehicle? When we feel that they are necessary for the safety of the child then similarly, a crate is necessary for the safety for your pet dog. It will not only keep him safe during travel but will also give him a quiet place in the house where he can relax. If done correctly, dog crate training can go a long way in keeping your dog safe and secure and out of harm’s way. Any unwanted behavior associated with dog crate is more due to improper training and not due to the crate itself. Hence dog crate training is very important and you should do it in steps. We will cover all the steps in detail in this guide. But, let us first start with the basics. We will first start by answering what is crate training. Then we will outline the steps involved in training a puppy as well as an older dog. We’ll also look into the benefits of crate training and some cons associated with using a dog crate. Crate training definition: Dog Crate training is the process of making a puppy or a dog, learn to recognize a crate as his private resting place. It involves following various steps, starting with making a puppy familiar with the crate and finally accepting the crate as his own. The dog should finally be able to associate the crate with safety, peace and happiness. He should be willing to go inside the crate without any force on your part. And in order to achieve this, the training steps are very important. You will have to work on each step very patiently and give your pet time to adjust to the crate. Any impatience on your part will result in more harm than good. Assuming you have brought a few weeks old puppy home, you will have to start crate training as soon as possible. Because this is the time when your pup’s brain is at the formative stage. By giving the right type of training during this time the success rate of crate training increases. Just give the pup a few days to adjust to your home and then you can bring a crate and put it at the place you find most suitable for the pup. Generally, in the initial days the crate is put in that part of the house where there is lots of activity going on. A place from where the pup will be able to see other members of the family frequently. The idea is to not make the pup feel isolated. Despite being in the crate he should feel he is still part of the family and is not forgotten. When you set up the crate just remember to keep the door open. You can tie the door to some furniture in order to prevent the door closing shut suddenly. The sound and the suddenness of the crate door closing might frighten your pup and make him avoid the crate. You can start off by putting some blanket inside the crate to make the interiors comfortable. Then you can either put some treats inside the crate or may be some toys. Put in things that your pup likes the most. Whatever is inside the crate should attract him towards the crate and make him want to go inside it. Once your pup starts going inside the crate to eat the treat or play with the toy, do not close the door. This will frighten him and make him feel confined. Let your pup go in and out of the crate out of his free will. Just put the treats/toys further inside the crate everyday so that your pup becomes familiar with the whole crate. By this time you can also start giving him his meals inside the crate. After some time when your pet has become quite comfortable with the crate you can shut the door. But do this in a very natural way and without making much noise. When your pup is busy playing with the toy or eating the treat, shut the door quietly and sit beside the crate with him. Talk to him and be there with him till the time he is inside. Let me share another thing, which worked very well for me. I closed the door half way and left it there for a while. Then, closed it little bit more every time. The puppy noticed this. But as it was not completely shut, he did not freak out. You know what I mean! So, my approach was very slow and gradual. The puppy could come out of the crate by just pushing the door. Then, after little bit of practice, when I shut the crate door completely it became very natural for him. Still, I did not put the crate door latch on. In other words, he could still open it with a push. Try it out, and it will work for you as well. Open the door after few minutes only and repeat this exercise many times. Once your pet starts sitting inside comfortably you can leave him for a few minutes and then come back again. Increase the separation time little by little. With patience and practice your pet dog should be able to stay in the crate for extended period of time in your absence. Your pup may whine when left inside the crate initially. Either he wants to relieve himself or he simply wants to be out of the crate. Make sure what the case is. If you have taken him out just before crating him then his whining is simply his displeasure about staying inside. Do not scold him but just ignore his whining for some time. Make sure you take him out of the crate only when he stops whining otherwise he will relate whining with getting out and will do so every time he does not want to stay inside. Always walk your pup/dog before crating him. This way he can stay longer inside without needing to go out. Do not crate pups or dog for longer period of time. You can crate a pup for a maximum of four hours and an adult dog for a maximum 8 hours. Ensure your pet is getting enough exercise throughout the day. It is a good idea to get a pet sitter or a dog walker in case you are unable to provide the much needed exercise to your pet. What is crate training purpose? It is to confine your dog to keep him safe in the house and during travel. It is not for punishment. Hence, never use the crate for punishment. You want your dog to associate happy memories with the crate. This will make him positive towards his crate. Using crate as punishment will undo all the training effort and you will have a hard time training your dog again. What are the benefits of crate training a puppy? Despite many counterclaims, dogs do create a den of their own. Whenever they feel insecure they like to go inside their dens. In case of wild dogs, the den provides protection from predators and hunters. It is also an ideal place to give birth to their young ones. When a dog is domesticated, he tries to create his den with whatever is available in his surroundings. You must have seen a dog hiding under the table to escape hyperactive kids or when he hears firecrackers. At that time the space under the table or a bed is his den. It is his sanctuary where he can go whenever he feels stressed. And that brings us to the question, what is crate training used for? It is used to help a pet dog recognize the crate as his home den. By providing a crate we help our pet to create a den for him. It is important to remember that the den is just a temporary sanctuary and not a permanent home. You should use it for short period of time only to maintain its positivity. If you over use the crate then your pet will start associating it with loneliness and will start disliking it. Other than becoming a “den” for your pet at home, let us find out what are the benefits of crate training a puppy. Puppies learn faster than older dogs hence providing them with the right type of crate training will go a long way in forming good habits. Since dogs do not soil the place they sleep in, a pup will become potty trained soon. Generally, crates come with a divider which you can use to divide the crate so that your pup has just enough space to sit, stand and turn around. There should not be any place where he can relieve himself. Since he will not like to soil his place of sleeping he will ask you (by whining or other means) to take him out of the crate for relieving himself. This way he will learn not to dirty the inside of the crate and become house trained. According to a survey by American Automobile Association more than half of pet owners take their pets for car rides each month. Driving a car with an unrestrained pet inside is highly dangerous and can cause accidents. During such times if your pet stays inside the crate, it is not only safe for you it is also safe for him. You can learn more about the risks associated with travelling with unrestrained pet here. After road travel, comes air travel. Did you know that more than 2 million pets are transported by air every year in the USA? And there are only three ways in which you can transport your bundle of joy; Cargo, carry-on baggage or checked baggage. And all three require that your pet should stay in a cage or a container, which is equivalent to a crate. If your pet is already crate trained then he will not have a problem while travelling in a plane. This way he will be able to participate in more family outings. A crate will definitely help your pet when you have guests in the house. He can always escape to his metal den to avoid unnecessary attention from the guests and their kids. This way he will also be less under foot and prevent any tripping accidents. It is better than keeping him on leash all the time guests are at home. It is also better than sending him to the basement or locking him inside an empty room. By being in a crate he will be safe yet not isolated. The crate training will also come in handy when you have to leave your dog alone in the house for some time. It will keep him out of any mischief and keep your home furniture safe from his inquisitive mouth. As you can see that there are a number of benefits of crate training a puppy. It a habit that will not only help you, but will be also be equally beneficial for your dog throughout his life. When to start crate training a puppy? The earlier the better will be the answer to this question. But specifically, a puppy can be crate trained when he is 8 weeks old. Puppies are like a blank slate without any prejudices. If you train them properly then they will develop a positive bonding with the crate. There are two important things to note here if you are buying a puppy. First there are state laws that govern the age of puppies for sale. According to these laws, no one can sell a pup unless he is more than 8 weeks old. And the reason behind this law is simple. A pup needs to be with his mother and littermates so that he develops properly. In order to prevent any physical or behavioral problems a pup should not be separated from his mother too soon. When you start crate training then you will need to schedule your training in accordance to the above two points. In case you have a pup that is younger than the recommended 8 weeks due to reasons like mother’s death, then start crate training only when he is 8 weeks or more. There are a few points that will be well worth remembering when you are crate training a puppy. Puppies can hold their bladder for as long as one hour per month of their age. Hence, if you start crate training too early then you will have to frequently let the pup out for relieving himself. By 8-10 weeks of age the pup will be able to hold his bladder for approx.. two hours which will give you sufficient amount of time to finish small chores while your pup is inside the crate. Till 8 weeks of age the brain of the puppy is in formative stage and this is the time he will learn quickly. If you start too late, the pup might pick up some bad habits, like soiling the house without warning, which will become difficult to get rid of. Remember not to keep the pup in a crate longer than four hours. This is the longest that a four month old pup can hold his bladder. If you leave him longer than that, then he will wet his bed and blankets. Socialization is an important aspect of overall development of a dog. You will have to give ample opportunities to your pup to socialize so that he becomes a friendly dog later on. So, even if you crate your pup during the day, make sure to give him every possible opportunity to socialize in his waking hours. In case you have to confine your pup longer than the recommended hours, then it will be better to create a play pen for him where you can put his crate, some toys, food and water and an area where he can do toilet (like newspapers or pads). 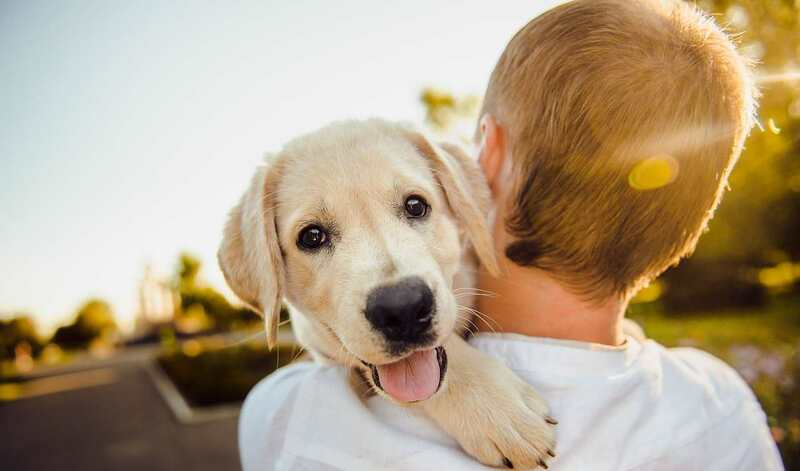 Though the answer to when to start crate training a puppy will also depend upon the pup’s breed (some breed of dog’s learn faster), their feeding schedule and so on, it is important to be consistent and patient during the training period. It will help speed up the crate training process and lead to fewer disappointments. How long can you keep a puppy in a crate? Generally, long periods of confinement are not recommended for pups of any age. As a rule of thumb you can keep a pup inside the crate for as long as they can hold their bladder. For pups it is one hour for each month of their age. That will mean you should not leave a pup of 8-10 weeks for more than 1 hour in a crate. Similarly you have to work out the confinement hours according to the age of the pup. By 3 months of age you can leave your pup for a maximum of 3 hours only. During the night time you can leave the pup inside the crate but remember to set an alarm for his bathroom breaks! Some smaller breeds of dog have smaller bladder and hence might require frequent bathroom breaks. Some dogs might have medical problems that make them unable to control their bladder function. There are certain breeds of dog that are difficult to train. It will depend upon their temperament as the statistics of American Temperament Test society Though the statistics are not a result of any scientific study, they help you to get a general idea of a particular breed’s stability, friendliness and aggressiveness. Hence, how long you can confine a pup will also depend upon his personality. How long a puppy will be happy in a crate will also depend upon its past history. Sometimes puppies are bred in puppy mills (places where puppies are bred with utter disregard to their well-being) and if you get a pup from there then he might be scared of a crate and not want to stay in it for long. Once a pup becomes older and is completely housetrained, it is better to leave him in a playpen. The playpen will give him enough area to exercise. If you keep the crate inside the playpen then it will act as a “bedroom”. Use crate only for travelling or when you expect some guests in the house. If you are working full time then you might wonder how long can a puppy be left alone during the day. Having a pet at home is a joyful experience but working pet parents are many times consumed with guilt of leaving their pet alone for too long. So, how long is too long, let us find out. An adult dog can be left alone at home for a maximum of 8 hours in a day. But a pup cannot be left alone for more than 4 hours a day. Since pups need to go out often, leaving them home alone for extended hours will result in house soiling. It might also result in various behavioral problems. According to a detailed study done by the Peoples Dispensary for Sick Animals, Great Britain, undesirable behavior in dogs is a result of lack of appropriate socialization. If a pup stays confined for long hours then he will get fewer opportunities to socialize, less exercise and less mental stimulation. All these things are very important for overall physical and mental development of your pup. You can read more here about the details of the study. Certain breeds of dog are not comfortable being alone whereas other breeds are just fine on their own. If you want to know more about which breeds of dog adjust well to staying home alone you can read that here. Smaller dogs will have to be let out more frequently than larger size dogs because of the obvious differences in their bladder size. A healthy pup will be able to stay longer than a sick pup. A sick pup won’t be able to hold it long as a healthy pup can. Well, it will not be very kind on the pup to leave him home alone for long hours as soon as he arrives in your home. You will need to take some time off from work to acclimatize him to his new surroundings. If you are unable to so then it will be better to arrange for someone to do all that in your absence. As he becomes used to his new home, you can start leaving him home alone either in a crate or in a playpen. Give him enough toys to keep him positively occupied. Being alone for long periods can result in boredom and destructive behavior. Leaving a pup alone should not be governed by just his bladder control ability. A pup has various other needs like play, exercise, socializing and so on. Hence, make sure someone is there to let your pup out after he has had his meal or drink or after waking up. Each dog is different and will react differently to being left alone for long hours. Observe your pup’s behavior and make changes to his schedule accordingly. Can you crate train an older dog? There is still a substantial portion of the pet parent population that does not keep their pets restrained while travelling. According to statistics, more than 80% of pet parents in the USA do not keep their pets restrained while travelling by car. When they have to take their pet by air then they are faced with the inevitable task of crate training their pet in order to be able to take them along with them. This and many other instances will require crating an older dog. But, is it possible to start so late? Can you crate train an older dog successfully and without any negative effects. Well, it will depend upon many things one of them being the past experience of the dog with a cage/container/crate like thing. It will also depend upon the dog’s temperament. But, with patience and by following the right steps you can train an older dog. So, what is crate training an older dog like and how it is different from crate training a puppy? The steps for crate training an older dog will be similar to that of a puppy except that it will take more time on each step. There are a few things that should be borne in mind while crate training an older dog. Older dogs take more time in learning new things than younger dogs. Experiments have shown that though older dogs can learn new things, it just takes them a little more time. So you will have to be extra patient with him. If you have an adopted dog with some bad memories of crate (for example a rescued dog) then crating him will require extra care. It will be important to give the dog ample time to become used to the crate and to not force him at any point of time. Unlike puppies, older dogs have preconceived notions about things. They might take an instant liking to the crate or might ignore it. You will just have to keep on practicing till your pet accepts the crate as his den. Select a crate that is appropriate for your dog’s weight and size. The Association of Professional Dog Trainers has listed the appropriate size of crate for different breeds of dog which you can access here. Too small crate will make him uncomfortable and too large is not safe for travelling. The size should be enough for your dog to sit, stand and turn around in it. Place the crate in one of your pet’s favorite location in the house. It can be the kitchen or the hall. Just make sure that he should be able to see other family members from the crate. If your dog shows signs of interest in the crate and goes inside willing, then appreciate him and give him treats and toys to play inside. If your dog ignores the crate then you will have to make it attractive for him. Place a blanket or his favorite toys inside the crate. Put in things that will make your dog want to go inside the crate. You can even place his bedding inside if that makes him want to go inside. Once your dog accepts the crate as part of the house and is no longer indifferent to it you will have to make him want to stay inside the crate for some time. You can start giving your dog his meals inside the crate. This will make him associate the crate with happy things. It will also keep him occupied for some time. The rest of the steps are similar to crate training steps (step 6 to step 8 under crate training methodology) of a puppy. Just to sum up: When you close the door for the first time, you will have to do it gently and quietly. You will have to spend some time with your dog when he in the crate with its door closed. Once he becomes comfortably settled inside you can start leaving him, first for short durations and then later on for longer durations. When you are crate training an older dog, be prepared for the training to last several weeks. Older dogs take time but you can eventually train them. As a new pet parent it is important to know the benefits as well as the downsides of using crate for your furry friend. Let us start with listing the pros of crate training. Remember, the advantages of a crate can be fully gained if your pet is trained properly. It will mean that your pet regards the crate as his den, a happy place and willingly goes inside. First and foremost, crate will keep your pet safe from many things. While travelling by road, you will be able to drive without any distractions keeping you and your pet safe. If you travel by air, you can safely take your pet along with you if he is crate trained. It is better than leaving him home alone or with a day care. At home too, it is better to keep him safely enclosed than worry about things he might be doing in your absence. There have been instances where pet owners have come home to find their pets in less than favorable situations. You can effectively use crate training to house train a new pup. Since a pup will not soil the place he sleeps in, he will learn not to soil the house also. He will learn to let his owner know when he wants to go out instead of eliminating at any place he wishes. Everyone likes to have a place of their own where they can retire to get some quiet and peace. Similarly by giving your pup a crate you will give him his own private place. A place he will learn to love with proper training. When he feels frightened because of any reason like thunderstorms or unruly children of guests, then he can safely go to his crate. Situations which require carrying your pet, like emergency evacuations or taking your pet to the vet will become a lot easier if you can carry your pet in the crate. It will also be safer and more comfortable for your pet to be carried in this way. If the owner crates his pup or dog for more than the recommended hours then his pet will start developing behavioral problems. He might become less social and take to barking aggressively, biting or showing other signs of violent behavior. This is the reason most professionals recommend to stop crating a pet once he is fully house trained. Keeping a pet confined in the crate unnecessarily for long hours affects his mental health and might lead him to depression. Using the crate as punishment tool will make the dog associate it with negative feelings. He might exhibit physical distress signs like shaking or vomiting when put inside the crate. If the crate is not of the right size then it might lead to physical problems in the dogs. If a dog stays in an ill sized crate for a long time then he might develop bone diseases and find it difficult to stand and walk properly. Similarly if crating is not accompanied with sufficient amount of exercise then it might lead to weight gain or obesity in the dog. Confining the dog too long in the crate may result in bladder problems for your pet. Since he will not like to wet the place of his sleeping he will try to hold it for too long resulting in urinary tract problems for him. And if he is unable to control for long then he will have to sit or sleep in a wet place till his owner comes and changes his bedding. Apart from the above problems, if you forcefully crate an anxious or escape minded dog then he will definitely try to break free from the crate. He might try to chew on the crate or try to bend it. All this might lead him to grievously injure himself. Hence, as a responsible dog owner it becomes important to use the crate wisely. Impart crate training in a timely manner. Go at the pace of your pup. If you want long term healthy and happy outcomes then approach crate training with the right attitude. It will result in a happy, healthy and safe dog. Are you looking to crate train your dog or puppy? By now you must have read all about crate training, its benefits and the training steps. You might be having doubts like, how to put into practice all the stuff you have learnt? How exactly to schedule the training steps? How to train a pup if you have only the weekends freely available? Well, no need to despair, because that is what we will be talking about in the next few paragraphs. We will present a few crate training schedule examples which you can use for your pup or dog. You can change the schedule by days or hours depending upon the response of your pet to crate training. The schedule is flexible and will depend upon your pet’s age, breed, feeding schedule and other factors. The basic steps of crate training a dog or pup will remain the same. Set up the crate at a favorable location in the house, preferably where there is a lot of activity going on, like the kitchen or the living room. Keep the door of the crate open. If possible, tie it up to some furniture. Make the crate attractive for the pet. Put in treats, toys, bedding or a favorite toy of the pet inside the crate. Let the pet go inside the crate out of his free will. Do not force the pet inside. Also, do not pick him up and put him inside. He should know from where to go in and how to come out. Once he goes inside the crate to eat the treat, praise him. After repeating the above step 10-15 times, stop putting in treats inside the crate. Instead, ask your pet to go inside the crate with a command like “crate time” or “go in”. Once he goes inside, then give him a treat and praise him. Repeat the above step for 10-15 times more. Now you can start giving your pet his meals inside the crate. Once he is eating his meal or is comfortably playing with his toy, you can shut the door. This is one of the most important steps of crate training. Some pet parents find it to be most difficult too. The pet should not feel confined or frightened by the closed door. Shut the door in a way so as not to frighten your pet. You can shut the door only half way at first and then little by little you can close it fully. Stay beside your pet when he is inside the crate. Open it after a few minutes time. Repeat the steps 9 and 10 for a number of times, increasing the time gap between the closing and opening of the crate door little by little. Now you can leave your pet in the crate and go to another room. Come back after a few minutes only. Increase your absence time from 5 minutes to 10 then 15 then 20 and so on. Once your pet starts staying in the crate for more than half an hour without you, you can start implementing the schedules given in this article. For puppies, the crating time should never be more than the time they can hold their bladder. This is one hour per month of their age. Hence, an 8 weeks old pup should never be put in the crate for more than 1 hour. All the crate training schedule examples in the article have assumed a maximum of 4 hours of crate time. You can refer the following table for the maximum crating time for a puppy. It is important to schedule the crate training according to your routine so that eventually the pup starts waking up with you in the morning and sleeping at your time during the night. This way you will able to spend maximum time with him during his waking period. It will also be less stressful and tiring for you as well as for the pup. 10 p.m. Crate time for the night. You might have to wake up in the night once or twice to let the pup out to relieve himself. Crate training schedule for working owners will be a bit different than that of stay at home pet parents. As working pet parents you will have to crate train the pup according to your work schedule. Assuming you do a 9 to 5 shift, you can use the following crate training schedule example to crate train your pup. 12 p.m. / 1p.m. (depending on this time adjust the below given schedule) Take the pup out of crate for his potty break. If possible you can come home in your lunch break or ask your neighbor or friend to help you in this. 6 p.m. As soon as you come home take the pup out of the crate. Take him for his potty break. 6.15 p.m. Engage in some active play or cuddling with the pup. Take him for a short walk. In case you find the above crate training schedule a bit difficult or lengthy to adhere to you can try the following weekend schedule. You can use this schedule over the weekend or a long weekend. Generally, it is assumed that pups take some time getting used to the crate or to a particular schedule. But if you are extremely time constrained then you can give this schedule a try. You might get lucky and get your pup potty trained in 3 days! The basic steps and timing will be similar to the crate training schedule examples shown above, but just a bit fast track. Friday Night Make the pup get used to the crate. Follow the crate training steps 1 to 5 only (given in the article in summary form). Saturday Steps 6 to 12, but remember to leave the pup inside the crate for very short duration. Do not extend the alone time now. Sunday Step 12 and 13 with extended time periods. Make sure to give your pup plenty of play time before you put him in the crate. This will make him tired and he will happily want to go inside the crate and sleep. If all goes well during the weekend then you can crate the pup for Sunday night as well. You can then follow the crate training example shown for working parents in the article from Monday onwards. Throughout the training and later on too, you should keep a few do’s and don’ts in mind when you are making your own crate training schedule for your pup. Never force a pup to go inside as it will instill a fear in his mind towards the crate. Do not use the crate for punishment. In fact, ensure that the crate is associated with only positive things like treats or meals or toys. Do not carry the pup and put him inside. This way he will not know how to come out on his own. Do not put your pup with his leash or collar on because it might get stuck somewhere inside and strangle him. Do not put a sick pup in the crate as he will not be able to hold his bladder for longer period of time. Ignore the whining of your pup during the training period. If you let the pup out when you hear him whining then he will think that whining gets him out so he will whine every time you put him in the crate. Do not crate your pup for long hours. He might not be able to hold it for that long. Use the table given in the article as a guide for maximum crate time. Do not put an anxious pup inside the crate. He might try to escape from the crate and injure himself in the process. Every dog is different and might have a bit different potty schedule then the one outlined in the article. You will just have to adjust the timings according to your pet. You can use the crate training schedule examples given in the article as a guide and then make your own crate training schedule for your pet. If you have a concern about crate training while you are at work and if it is cruel, then you must read this beautiful article.